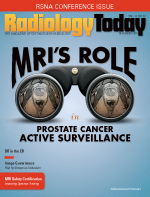 The role of MRI in prostate cancer management is becoming more refined. Still, legitimate concerns about cost and the lack of universal guidelines exist and researchers say those areas need to be addressed. As the number of emergency departments in the country slowly declines, the introduction of portable DR allows physicians to be even more effective in their care of an ever-increasing number of patients visiting the ED. While more is understood today about MRI safety and there is a greater capacity to control the effects of MRI, increased knowledge is not reflected in a reduction in MRI accidents. 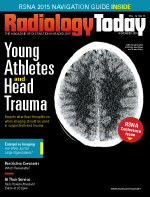 The use of imaging for suspected head trauma in youth athletes remains a delicate balancing act for many radiologists who must weigh the pros and cons of potential radiation exposure. When joining a new practice, radiologists should read any noncompete clauses in their contract very closely to ensure that the restrictions won't prevent them from being able to work elsewhere in the future. In another example of radiologists leaving the reading room and getting out in the field, radiologists were invited to be part of the onsite medical team at the US Open 2015 Tennis Championships. 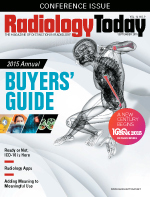 Our popular roadmap to the exhibit hall and course highlights at RSNA. 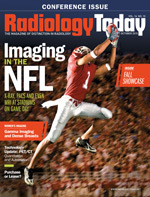 Radiology, thanks to advances in both the field and technology, is playing an increasingly larger role in diagnosing National Football League players' injuries as they happen—often without having to leave the stadium. Selecting the best adjunct imaging to complement mammography for women with dense breasts can be challenging. Some view nuclear gamma imaging as the most logical adjunct option. Take a look at the factors institutions use to decide whether to lease or purchase equipment. Clinicians are searching for new methods to both better detect smaller lesions and quickly ascertain whether a patient is responding to current treatments. 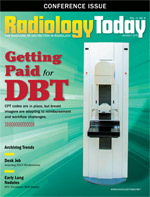 Scanner manufacturers are working to expand PET/CT tools and equipment to achieve that objective. ICD-10 will finally arrive on October 1, 2015, and there are several key areas that radiologists should take special notice of in order to ensure proper documentation and reimbursement. 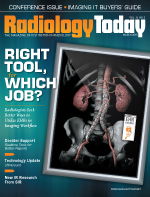 While they will likely never replace full workstations, a variety of apps are available for radiologists to use on their Android and Apple devices to help make their jobs easier and more efficient. Digital breast tomosynthesis is gaining acceptance in women’s imaging. However, imagers have had to deal with the challenges of sporadic reimbursement from insurance providers who still view the procedure as experimental. Radiologists put in long hours at their workstations, which can put them in uncomfortable positions. To alleviate some of this physical stress, considerations such as comfort, quality, size, and functionality should be top of mind when shopping for furniture for the radiology reading room. A recent study looks at combining lung cancer biopsy and radiofrequency ablation into one procedure as a way to both alleviate patient stress and reduce possible complications from multiple invasive procedures. As health care organizations seek ways to make medical images accessible throughout their enterprises, many are looking at their archives as a starting point. Health systems consolidation combined with rising demand for imaging is making an effective archiving strategy essential. As PACS needs become more complex, virtual solutions increasingly protect against real disasters, but many facilities and vendors are not there yet. The Society for Imaging Informatics in Medicine held their annual meeting at the end of May in National Harbor, Maryland, and Radiology Today was there. These are five pieces of information we took away from the event. Here's a roundup of some important studies presented at the society's annual meeting last month. Mobile imaging has always been a favorite of imaging professionals and that popularity is expected to continue to increase over the next five years into an industry worth more than $13 billion by 2020. 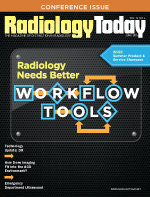 With greater requirements for value-based care, it is no longer enough for radiologists to share images and issue reports. 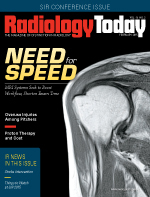 Now, they need to provide timely information, track performance, and train younger radiologists, and the technology needs to adapt to meet these needs. Not all conditions in the emergency department are immediately obvious to caregivers and these issues can be exacerbated if the patient is unable to speak. To circumvent these concerns, ultrasound has become more a common tool for physicians to promptly diagnosis and treat a variety of medical issues. The model for accountable care organizations continues to evolve as they become more widely used. 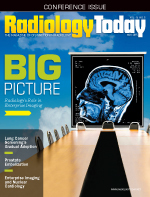 Because of this, the role of radiology groups within this model continues to evolve as well, and there are steps these groups can take to ensure radiologists don't get left behind. The benefits of DR over CR can be seen throughout the industry. Still, for many health care providers, making that transition often comes down to cost. As a result, some manufacturers are putting a greater emphasis on price while others focus on speed and dose reduction. As medical imaging has risen from a radiology-specific concern to an enterprisewide need, hospitals have had to adjust to the increasing demand for images, although making that adjustment is no easy feat. While insurance coverage for low-dose CT lung cancer screening has opened the gates, many imaging professionals believe that the number of patients who actually get screened will be well below the 7 to 10 million people now eligible. However, these professionals remain optimistic that there will be a gradual increase in the number of patients screened in coming years. Clinical trials are expanding as IR researchers investigate outcomes, patient selection, and the economics of this investigational alternative to surgery for enlarged prostates. Based on recent positive findings, researchers are questioning the 2013 decision by the Centers for Medicare & Medicaid Services to cover only three posttherapy follow-up FDG PET/CT scans per patient and per tumor type, including lung cancer. 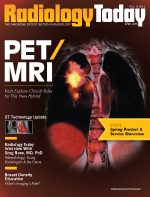 Over the past 15 years, PET/CT has replaced standalone PET as the primary tool for many cancer diagnoses. Now researchers are investigating how PET/MRI may provide better information in some cases, as well as reduced radiation exposure. Greg Rose, MD, PhD, CEO of Rays, a teleradiology company based in Littleton, Colorado, recently discussed where he thinks teleradiology and radiology in general are headed. Nearly half the states have dense breast notification laws, and a bill for a national law has been introduced in Congress. Yet, an educational gap between imagers and primary care physicians remains a hurdle that the industry will need to conquer. Recent buzz regarding CT has centered on a handful of topics, most notably CT for lung cancer screening and multienergy exams. Not surprisingly, these are areas in which companies have focused their new products. How Do You Know It's the 'Right Test'? 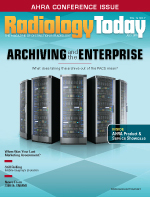 As EMRs have evolved into EHRs over the past 20 years, radiologists have continued to strive to effectively integrate them as both the types of information and the potential value of that information to clinical practices have grown. Image quality remains the biggest concern when it comes to what's trending in ultrasound. However, improved workflow, ease of use, and ergonomics remain key to improving the ability of clinicians to provide accurate diagnoses. Learn about the latest research findings presented at the Society of Interventional Radiology's annual meeting, held earlier this month in Atlanta. CT image quality continues to improve. As a result, radiologists are able to notice more incidental findings. Now, the ACR and Massachusetts General Hospital will leverage the Nuance Communications PowerShare Network to bring clinical guidelines to the radiologists' workflow, helping them determine which incidental findings are likely benign and which should be further inspected. MRI manufacturers, noting an increased expansion into smaller community hospitals, have adjusted their product lines in order to best serve those facilities. For more than a century, pitchers have suffered arm injuries—with what most perceived as little rhyme or reason—while playing baseball. However, a recent study of shoulder MRIs by researchers at Thomas Jefferson University Hospital may shed light on the cause of some of the most severe injuries. While there is little debate about the effectiveness of proton therapy for treating certain cancers when compared with conventional radiation, the cost of the treatment has many institutes grappling with the idea of building and operating a proton therapy center. A recent study showed that a combination of an endovascular thrombectomy procedure and tissue plasminogen activator application to the clot produced better outcomes than the standard treatment. The result has produced optimism from those who support endovascular intervention. 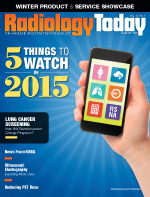 Read about the latest research findings presented at RSNA 2014. The use of manual palpation limits physicians' diagnosis ability to the areas of the body that are accessible by their hands. However, through the use of ultrasound elastography, doctors can now reach farther into the human body to help diagnose a variety of ailments. For years, an emphasis has been placed on dose reduction in CT exams. Yet PET scans, which can expose patients to as much or more ionizing radiation than CT alone, have not received anywhere near the same amount of attention, causing some in the field to ask why. The Centers for Medicare & Medicaid Services proposed coverage of low-dose CT lung cancer screening for certain patients last year. It's not clear how the expanded screening might unfold in day-to-day use.